Join us on Twitter to discuss Google Authorship and the engagement of your readers on a special #VCBuzz Twitter chat next Tuesday (July 15). The title is Make the Most of Google Plus Interactions. 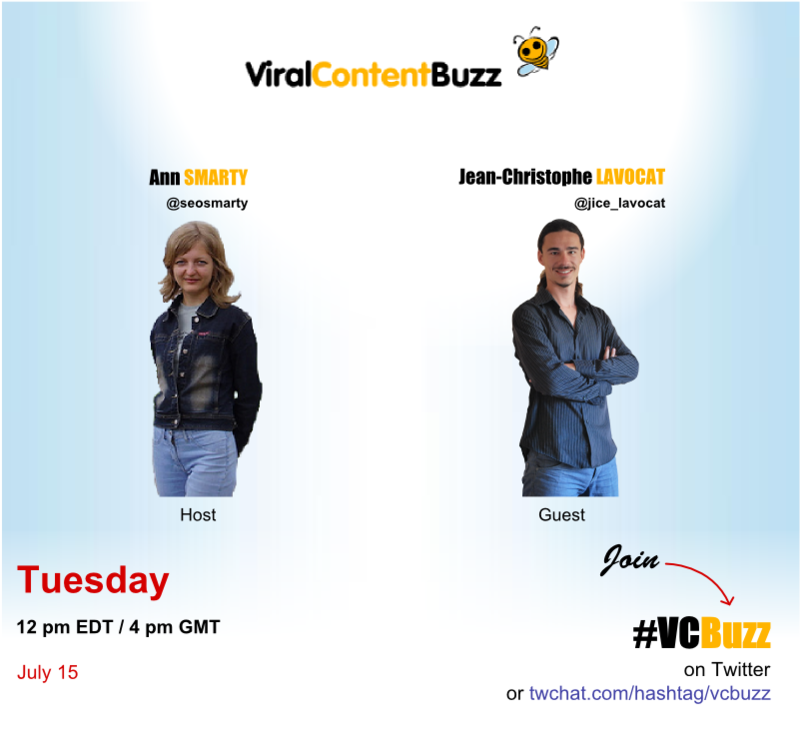 During this Twitter Chat, Ann Smarty and the folks from VCBuzz will ask Jean-Christophe Lavocat about Google Plus, Elokenz, the Authorship system, and how marketers and bloggers can make the most of these tools. The discussion will be live during more or less one hour. If you have never join a twitter chat before, do not worry, it’s like a regular Twitter discussion but with a guest, a predefined topic, some moderators, and many public attending it, and retweeting it. You will be interacting with a guest and following a semi guided discussion. One thing extra you need to know : a twitter chat goes super extra fast. So, if you want to enjoy it, it’s often better to use Twchat to mute some noise and echo. The chat will be held at 12PM EDT / 4PM GMT. So if you live in Paris (or a related time zone) you should be on Twitter at 6PM just before the end of office hours. If you live on the East coast of the US, you need to prepare a sandwich to enjoy during the chat which will be at noon. How to enjoy it ? To better enjoy the event, we recommend you the following. First save the date and book a free hour. The chat activity is so intense that if you had an important task to perform during the same time, you will probably not be able to focus on both the chat and your task. Second, don’t forget that the chat is public and that you can interact with everyone to create connections and find people with similar interests to you. Third, if you want to organize a Twitter chat, you can find a lot of tips from Ann Smarty’s guide : 5 Steps to Hosting Successful Twitter Chats (if you read French, you can also check this post on Graphemeride). Finally, as a chat is always better when there is people to chat with, we would love if you could share the news about it. So you can either Tweet about it, put a comment on Facebook or a post on Google+.